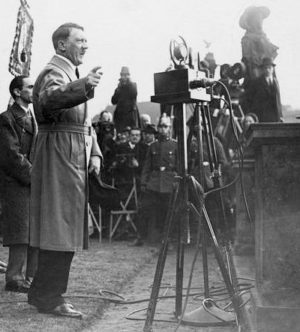 Introductory Note: This recorded address by Adolf Hitler was distributed on 50,000 phonograph discs during Germany’s fiercely-contested national parliament election campaign of July 1932, in which his National Socialist movement emerged as the country’s largest party. This “Appeal to the Nation” is similar in content and tone to many other speeches he gave in 1932, which for Germans was a year of mass unemployment, economic paralysis, and a broken, unresponsive political system. This historic address is particularly interesting during this 2016 US presidential election campaign, with media commentators claiming that Donald Trump’s appeal and campaign style is similar to that of the German leader. For Germans 1932 was a year of mass unemployment, economic paralysis, and a broken, unresponsive political system. The world economic downturn, known in the US as the Great Depression, had shattered production and business life. This was also a year of intense campaigning in four fiercely fought nationwide elections — two for the Reichstag or parliament, and a two-part presidential contest. The most pressing issue in these campaigns was, of course, the economic calamity that had brought widespread misery and put millions out of work. Because the “establishment” political parties were utterly unable to get a grip on the nation’s economic ills, growing numbers of citizens turned with hope to the radical Communists or National Socialists. During this final year of Germany’s liberal democratic “Weimar Republic” system, one inept administration after another tried to tackle the nation’s daunting problems. Lacking popular support or backing from a majority in the Reichstag, each President-appointed Chancellor governed only by authority of the constitution’s “emergency decree” clause. In the 1932 presidential election campaign, Germany’s “establishment” parties, including the leftist Social Democrats and several “centrist” parties, supported Paul von Hindenburg – the 84-year-old incumbent who had served as Reichspräsident since 1925. His most formidable challenger was Adolf Hitler, the 43-year-old leader of the National Socialists. No candidate in the March 13 election received an outright majority, although 30 percent voted for Hitler, and 13 percent for the Communist Party leader. This set off a new round of feverish campaigning for the April 10 run-off election, in which von Hindenburg garnered 53 percent of the votes, thereby remaining President. Hitler increased his share of votes, gaining 37 percent of the total. Adding to the year’s fatiguing round of electioneering were contests for provincial legislatures. In the April 24 elections in several German regions or states, the National Socialists emerged as the most popular party. The victory of Hitler’s movement was most significant in Prussia – by far the largest German Land or state, with three–fifths of the nation’s population. In the fiercely contested Reichstag election of July 31, in which 84 percent of eligible voters cast ballots, the National Socialists emerged as the largest party, by far, with 37 percent of the total. In second place came the Social Democrats, with 22 percent, followed by the Communist Party with 15 percent. In the hard-fought November 6 Reichstag election, the National Socialists once again came out as Germany’s most popular party, with 33 percent of the total. The Social Democrats trailed in second place with 20 percent, followed by the Communists with 17 percent. A crucial factor in the party’s appeal was its emphatic call for national unity and unselfish devotion to the common good. This was unusual at the time. “In contrast to almost all of the other parties in the Weimar period,” noted Prof. Craig, “the National Socialist party did not direct its propaganda towards a single social or economic class or grouping of interests.” By conscientiously reaching out to all Germans – regardless of class, region or religious outlook – the Hitler movement became the country’s first “modern” political party. Hitler also worked harder than any other political leader. He crisscrossed the country by airplane (the first politician anywhere to do so) to address large meetings, sometimes several in a single day. During 1932 he gave a total of 209 public speeches. On one day, July 27, Hitler addressed a rally of 60,000 people in Brandenburg, and then to nearly as many in Potsdam, and in the evening he spoke to 120,000 gathered in a large stadium in Berlin, while an additional 100,000 heard his voice outside on loudspeakers. On July 20 poor weather delayed his arrival by airplane and auto to address a mass rally in Stralsund, which was to begin at 9:00 in the evening. At midnight the outdoor gathering of some 20,000 people was told that Hitler would arrive at 1:30 a.m. Still they waited. It wasn’t until 2:15 in the morning that he was finally able to address the large crowd. Hitler has often been portrayed as a ranting demagogue who won support with simplistic slogans, empty promises and crude appeals to feelings of resentment, fear and envy. That image is not accurate. If it had corresponded to reality, the National Socialists would not have won the support of so many German voters – who were among the best informed, best educated and most discerning in the world. In fact, the message of Hitler’s movement was more substantive and self-consistent than that of any other German political formation. Of the many parties that competed for votes in the 1932 elections, only the National Socialists presented a comprehensive program to tackle the economic crisis that laid out specific measures (which were later implemented after taking power). The National Socialists stressed that only a new outlook that rejected narrow, sectarian self-interest and put the needs of the entire nation first would enable the German people to build a healthy new order of social stability, economic security, prosperity, and enduring well-being for all. Two weeks before the July 1932 Reichstag elections, the National Socialist Party issued a phonograph record with a recorded address by its leader. 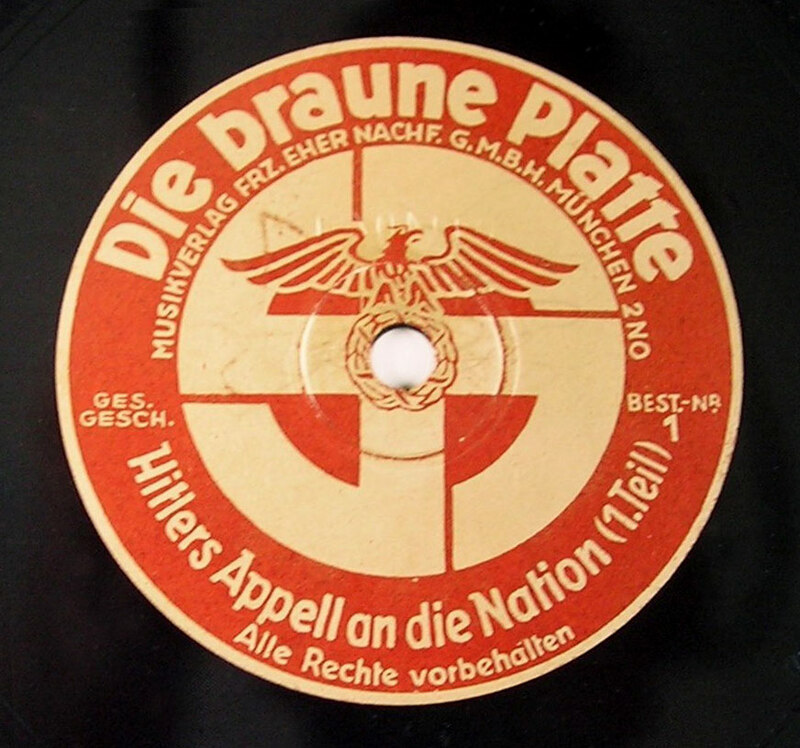 Some 50,000 discs with this Hitler “stump speech,” titled “Appeal to the Nation,” were made and widely distributed. This effort was all the more needed because Germany’s government-controlled broadcasting system took care to ban Hitler’s voice from the radio. This talk, which is a little more than eight minutes in length, is the only recorded address made by Hitler for the 1932 election campaign. In it he speaks emphatically but clearly, re-emphasizing points he made in many other speeches that year. He sharply criticizes the other political parties for their failure to deal with the nation’s economic woes, as well as for their narrow focus and divisive goals. Only the National Socialists, he emphasizes, are committed body and soul to the well-being of all Germans. MORE THAN 13 years have been allotted by fate to test and evaluate those who are in power today. But they themselves have handed down the most severe verdict possible by acknowledging in their own propaganda the failure of their efforts. At one time they wanted to govern Germany better in the future than in the past. Today, however, the only real result of their style of governing is for them merely to observe that Germany and the German people still live. During the days of November 1918 [when a liberal democratic republic replaced the monarchy], they solemnly pledged to lead our people, and especially the German worker, into a better economic future. Today – after they have had nearly 14 years to fulfill their promises – they are not able to cite the well-being of a single German occupational class as witness to the quality of their efforts. The German farmer is impoverished. The middle class is ruined. The social hopes of many millions have been destroyed. One third of all German men and women of working age is unemployed, and thus without income. The national government, the municipalities, and the states are heavily in debt, finances across the board are in disorder, and all the treasuries are empty. What more could they possibly have destroyed? The worse thing, though, is the destruction of faith in our nation, the elimination of all hope and all confidence. In 13 years they have had no success at all in mobilizing the strengths that slumber in our people. To the contrary! Because they fear an awakened nation, they have played off one group of people against another: the city against the countryside, the salaried workers against the government employees, those who work with their hands against those who work with their heads, the Bavarians against the Prussians, the Catholics against the Protestants, and so forth and vice versa. The activism of our people has been used up only domestically. With regard to the outside world, all that’s left are fantasies: fantastic hopes in a conscience of cultured humanity, international law, a world conscience, ambassadorial conferences, the League of Nations, the Second International, the Third International, proletarian solidarity, and so forth – and the world has treated us accordingly. Thus Germany has slowly declined, and only a lunatic can hope that the forces that brought about this decline in the first place could now bring about a resurrection. If the established political parties seriously want to save Germany, why have they not done so already? If they really wanted to save Germany, why has that not happened? If the leaders of those parties had honest intentions, then their programs must have been deficient. If, however, their programs were correct, then either their intentions were not sincere, or they were too ignorant or too weak. Now, after 13 years, during which period they have destroyed everything in Germany, the time has finally arrived for their own elimination. Whether or not today’s parliamentary political parties survive is not important. What is essential, though, is to make sure that the German nation is not completely destroyed. To remove these parties is therefore a duty – for in order to secure their own existence, they must again and again tear the nation apart. For years they have tried to persuade the German worker that he alone could save himself. For years the farmer was told that only his organization would help him. The middle class was to be snatched from the jaws of ruin by the middle class parties, and the economy by the parties of business. The Catholic was to seek his refuge with the Center party, and the Protestant in the Christian Socialist People’s Service. In the end even the house owners had their own political representation, just as did the tenants, the salaried workers, and the civil servants. These efforts to split up the nation into classes, walks of life, occupational groups, and religious beliefs, leading in that way, bit by bit, to a future of economic happiness have now, however, failed completely. Even on the day our National Socialist movement was founded, we were already governed by the conviction that the destiny of the German individual is inseparably bound up with the destiny of the entire nation. When Germany declines, the worker will not flourish in social well-being, and neither will the entrepreneur. Nor will the farmers or the middle class be able to save themselves. No, the ruin of the Reich, the decline of the nation, means the ruin and the decline of all! And no religious faction and no single German ethnic group will be able to escape sharing the same general fate. Even on the day our National Socialist movement was founded, it had already long been clear to us that the proletariat would not be the victor over the bourgeoisie, and the bourgeoisie would not be the victor over the proletariat, but rather that [in such a clash] international high finance would then ultimately be the sole victor over both. And that is what has come to pass! Recognizing this decline, 13 years ago a handful of people and I organized a new movement which, in its very name [National Socialist] proclaims the new national community. There is no such thing as a socialism that does not have the power of the spirit at its disposal; and no such thing as social well-being that is not protected by, and even finds its prerequisite in, the power of a nation. And there is no such thing as a nation – and thus no such thing as nationalism – unless the army of millions who work with their brains are joined by the army of millions who work with their fists, along with the army of millions of farmers. As long as nationalism and socialism march as separate ideas, they will be defeated by their united opponents. On the day when both ideas are fused together into one, they will be invincible! And who will deny that, during a time when everything in Germany is breaking apart and going bad, when everything in the business world and political life is coming to a standstill or even to an end, a single organization has experienced a tremendous and wonderful upturn? With seven men I began this task of German unification 13 years ago, and today more than 13 million are standing in our ranks. However, it is not the number that counts, but their inner worth! Thirteen million people of all professions and occupational groups – 13 million workers, farmers, and intellectuals; 13 million Catholics and Protestants; members of all German regions and ethnic groups – have formed an unbreakable alliance. And 13 million have recognized that the future of all lies only in the shared struggle and in the shared successes of all. Millions of farmers have now realized that the important thing is not that they recognize the necessity of their own existence, but rather that it is necessary to enlighten people in other walks of life and occupational groups about the German farmer, and to win them over for him. And today millions of workers likewise realize that, in spite of all the theories, their future lies not in some [Marxist] Internationale, but rather in the realization on the part of their compatriots that, without German farmers and German workers, there simply is no German strength. And millions of bourgeois intellectuals have likewise come to realize the insignificance of their own views if the masses of millions comprising the rest of the nation do not finally comprehend the importance of the German intellectual strata. Thirteen years ago we National Socialists were mocked and derided. Today our opponents are no longer laughing. A faithful community of people has arisen that will gradually overcome the prejudices of class madness and the snobbery of social standing. A faithful community of people that is resolved to take up the fight for the preservation of our people, not because it is made up of Bavarians or Prussians, or people from Württemberg or Saxony, or because they are Catholics or Protestants, workers or civil servants, middle class or salaried workers, and so forth, but because they are all Germans. Together with this feeling of unbreakable solidarity, mutual respect has grown, and from this respect has come understanding, and from that understanding the tremendous power that moves us all. We National Socialists therefore march into every election campaign with the single commitment that we will, the following day, once again take up our work for the inner reorganization of our national community. For we are not fighting for elective posts or ministerial positions, but rather for the German man and woman, whom we want to, and will, join together once again into an indivisible community of destiny. The Almighty, Who so far has allowed us to rise from seven men to 13 million in 13 years, will further allow these 13 million to once again become a German folk. It is in this people that we believe, for this people we fight; and it is to this people that we are willing, as thousands of comrades before us, if necessary, to commit ourselves body and soul. If the nation does its duty, then the day must inevitably come that restores to us a Reich in honor and freedom, work and bread! Adolf Hitler. Reichstag speech of Dec. 11, 1941.